OncoRad, Paris · 2018, Seiwert T. et al. Recent clinical studies have demonstrated the efficacy of anti-PD-1 in recurrent/metastatic HNSCC and upfront metastatic NSCLC patients. 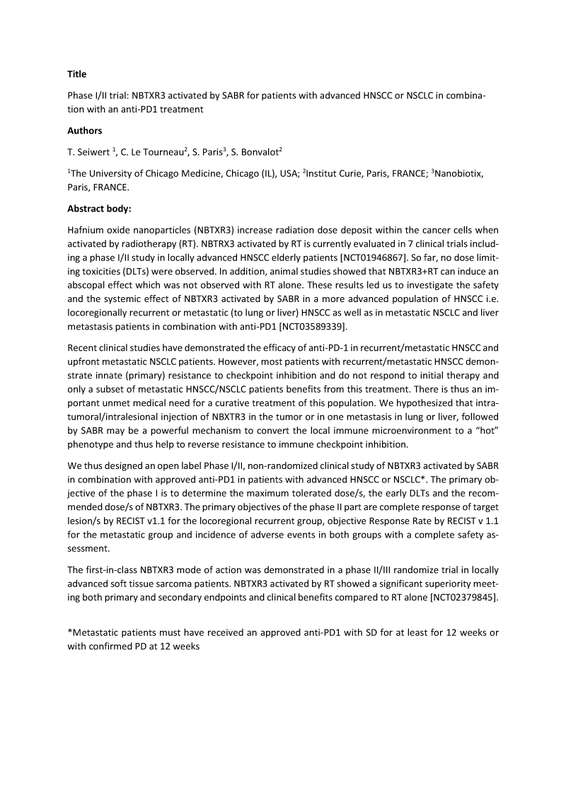 However, most patients with recurrent/metastatic HNSCC demonstrate innate (primary) resistance to checkpoint inhibition and do not respond to initial therapy and only a subset of metastatic HNSCC/NSCLC patients benefits from this treatment. There is thus an important unmet medical need for a curative treatment of this population. We hypothesized that intra-tumoral/intralesional injection of NBXTR3 in the tumor or in one metastasis in lung or liver, followed by SABR may be a powerful mechanism to convert the local immune microenvironment to a “hot” phenotype and thus help to reverse resistance to immune checkpoint inhibition. We thus designed an open label Phase I/II, non-randomized clinical study of NBTXR3 activated by SABR in combination with approved anti-PD1 in patients with advanced HNSCC or NSCLC. The primary objective of the phase I is to determine the maximum tolerated dose/s, the early DLTs and the recom-mended dose/s of NBTXR3. The primary objectives of the phase II part are complete response of target lesion/s by RECIST v1.1 for the locoregional recurrent group, objective Response Rate by RECIST v 1.1 for the metastatic group and incidence of adverse events in both groups with a complete safety as-sessment.